Incessant blustery northeasterly winds over much of the North Island of New Zealand from November through to March have contributed to unprecedented snapper catches along most of the North Islands west coast beaches. The associated flat sea conditions have also resulted in huge schools of snapper moving into the shallows and often to within 200 to 300 metres of the shore. West coast kitefishers have had a bonanza of even greater proportions than the legendary 1988 La Nina. Word travels quickly among fishermen, particularly when large fish are involved and this has led to a vast increase in the popularity of kitefishing on the west coast. Even old kontiki rigs which haven't seen the light of day for many a year are being dragged from under houses and the back of garden sheds to capitalise on the favourable conditions. Others are constructing their own rigs from whatever they can lay their hands on. 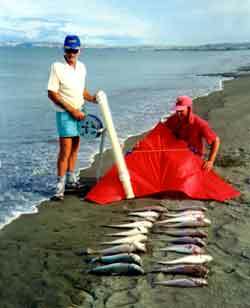 ABOVE : Mark Bannister with a catch of kahawai and red cod taken at Awatoto Beach Napier. Note that Marks rig is using his own older type 1:1 ratio reel. If you have and older fishing rig check your mainline for nicks and scuffs and read the article below for instructions on how to repair or convert your rig into the most efficient surf fishing rig for the west coast. The most efficient surf fishing rig that combines top fishing efficiency, strength, durability and safety for your multi hook kite or kon tiki surf fishing rig is to use the running clip system with either the correct sized round brass annealed crimps fitted to the mainline or a section of commercial fishermens pre-stoppered hook section fitted correctly into the mainline with aluminum crimps. As a general rule of thumb a 100kg mainline is ideal for fishing up to 25 traces on the west coast while those using 65kg mainlines should limit themselves to no more than 15 hooks per set when fishing the west coast. Another useful option for those with 65 to 80kg mainlines is to correctly crimp a 100 to 120kg hook section into the mainline, nothing is stronger than a crimped join. This gives additional security in the area where most breakages occur while maintaining the advantage of reduced drag in the rip on the remaining thinner 65kg mainlines. If no knots are used in constructing or repairing the mainline the breaking strain of the rig will be at least 40% greater than rigs with knots. If you are unable to do it yourself it is a worthwhile investment to get your crimping done professionally.